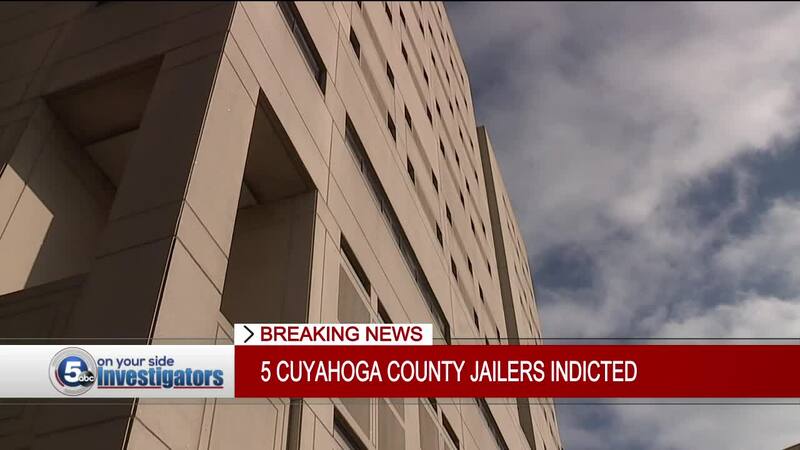 Five employees at the Cuyahoga County Jail have been indicted on various charges, including an officer who was indicted on charges related to the death of an inmate last August, and two officers who allegedly beat an inmate in a restraint chair and left him alone for two hours with a concussion. CLEVELAND — Five employees at the Cuyahoga County Jail have been indicted on various charges, including one corrections officer who was indicted on charges related to the death of an inmate last August, and two officers who allegedly beat an inmate in a restraint chair and left him alone for two hours with a concussion. Martin Devring, 60, was indicted on charges of tampering with records, dereliction of duty and interfering with civil rights, according to records from the Cuyahoga County Court of Common Pleas. Devring is accused of failing to provide 47-year-old inmate Joseph Arquillo with medical attention on or about August 28, 2018, as he lied motionless on the floor of the jail. Devring is also accused of falsifying records of mandatory checks on inmates on the day Arquillo died. The medical examiner's office says Arquillo had heroin, fentanyl and cocaine in his system. His death was ruled an accident. Devring’s arraignment hearing has been set for April 22 at 8 a.m.
Corrections officers Idris-Farid Clark and Robert P. Marsh were each indicted for interfering with civil rights and unlawful restraint. Clark was charged with felonious assault and Marsh was charged with assault. Marsh allegedly struck an inmate in the head while she was restrained in a restraint char and compliant on July 16, 2018, according to court documents. Clark allegedly sprayed half a can of pepper foam on the inmate’s face from less than a foot away as she was restrained, the indictment alleges. The indictments also allege that these actions violated the inmate’s civil rights, and that she was restrained of her liberty unlawfully. Both officers are due to be arraigned on the charged on April 22 at 8:30 a.m.
Nicholas Evans and Timothy Dugan were each indicted on charges of felonious assault, unlawful restraint and two counts of interfering with civil rights. Evans was also charged with tampering with evidence. The indictments allege that on March 22, 2019, Evans and Dugan strapped an inmate to a restraint chair and unlawfully punched him in the head repeatedly, causing a concussion. The incident was recorded on a wall camera. The indictment alleges that Evans and Dugan left the inmate in a restraint chair for over two hours after beating him, instead of immediately transporting him to medical. Evan also allegedly turned off his vest camera so it would not capture audio and video of him and Dugan beating the inmate. The indictments allege that Evans and Dugan violated the inmates Fourth Amendment rights by using unreasonable and excessive force on him. They also allege the officers violated in the inmate’s Fifth and 14th Amendment right by failing to provide proper medical care to him after they had beat him and caused a concussion. Evans and Dugan are also scheduled to be arraigned on April 22 at 8:30 a.m.